I have been working with computers since the mid '70's. Started out playing on a TTY terminal over a 110 baud modem. Owned my own frist PC (a Heathkit H89/90) in 1980, with a 300 baud Hayes Smartmodem, then moved to a US Robotics 1200 baud modem. Worked with almost every style of home PC in the '80's from Atari - Zenith. I have almost always worked with computers in some sort for all my jobs. Now I am a Systems/Network Administrator / Consultant. I am married for over 29 years, with 2 children and 2 grandchildren. I enjoy comedy music. 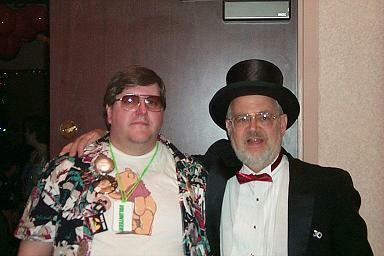 I own a lot of CDs of comedy musicians who have hardly been heard of, unless you are a regular listener to the Dr. Demento show (Dr. Demento is the guy in the top hat in the picture with me). Some of my phylosophies on life are to live it as fun as I can. Try to enjoy every moment possible. Just keep it light. I started running SETI@home classic because a friend was running it and gave me the idea. Now I run it because it's become somewhat an obsession with me. I believe that we are not alone in the universe. I do not know if we are looking in the right places, but it is nice that someone is at least making a consious effort to try. Since I have a bunch of computers that would be lying around doing nothing, I am able to allow them to SETI for now. I am starting to look at other projects, but I still think SETI will be my main project, and others will be just a small afterthought. I hope someday we have lots more listening devices. Different types, bringing in different information. Some on the ground, some in space. Also, now that things are getting a lot more stable, make different sized units. For faster machines allow them to process larger files, and slower machines can do smaller files.